A Unigine-based application can be implemented by means of C++ only, without using UnigineScript. This article describes how to add logic to your project by using the C++ language. Code written in C++ is the same for all supported platforms: Windows, Linux and OS X. The difference is in the way of compiling the project. Articles in the Development for Different Platforms section to learn more on how to prepare the development environment, install the UNIGINE SDK and build the application for different platforms. Articles on Typical Architecture of a Unigine-Based Application and Engine Architecture for better understanding of the Unigine C++ API operation in the engine architecture. Examples located in the <UnigineSDK>/source/samples/Api and <UnigineSDK>/source/samples/App folders. Open the UNIGINE SDK Browser. Go to the Projects tab and click CREATE NEW. Project - specify the name of your project. Project Path - specify the path to your project folder. SDK - choose the UNIGINE SDK. API - here choose C++ to start working with the C++ API. On Windows you can create C++ Visual Studio 2010 or C++ Visual Studio 2013 project. On Linux you can create C++ GNU make project. Architecture - specify the architecture of your target platform. Precision - specify the precision. In this example we will use double precision. 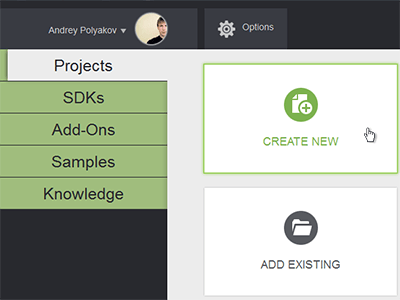 Click the Create New Project button. The project will appear in the projects list. 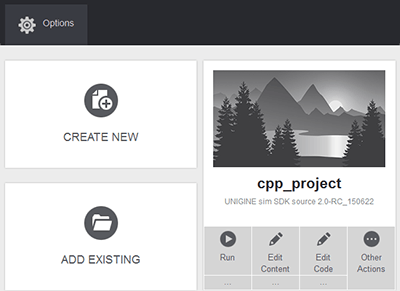 You can run your project by clicking the Run button. By default, in the world script file a WorldLight and a PlayerSpectator are created. You can leave functions of the world script empty, and create your own lights and players by using C++. In this section we will add logic to the empty C++ application project. The following example shows how to rotate the material ball that was created by default in your project. 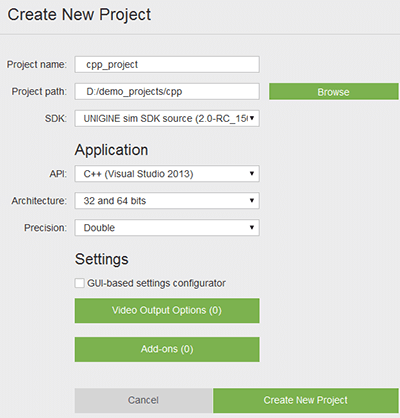 Choose your C++ project in the UNIGINE SDK Browser and click the Edit Code button to open the project in IDE. 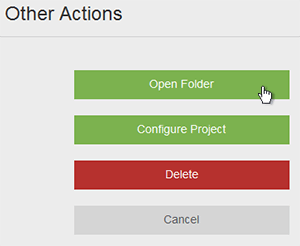 On the created C++ project, click on the Other Actions button and then the Open Folder button. 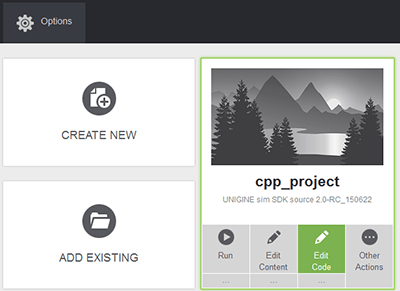 Go to the <YOUR PROJECT>\source\ folder and open the AppWorldLogic.cpp file with any plain text editor. Write (or copy) the following code in your project's AppWorldLogic.cpp file. 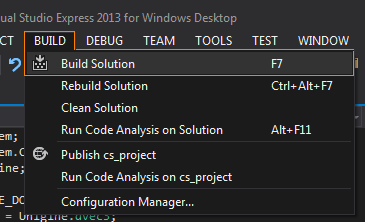 Build your project by clicking Build -> Build Solution in Visual Studio or press F7. 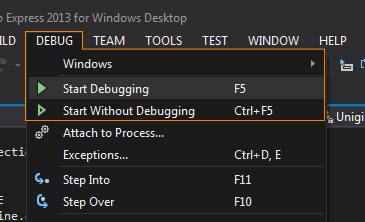 Start your project by clicking Debug -> Start in a proper mode in Visual Studio. Execute the make command in the terminal to compile the application. Launch the application by using the run script.